It is commonplace for homes with a septic system to be fitted with home septic alarms. Those septic tanks systems that use a pump to help you to move the wastewater from your house and septic tank over to your drainage area or leech bed will generally be fitted with an alarm to tell you that there are septic tank problems. When there is any type of an issue that is taking place with your septic system, the septic tank alarms will sound with a clear and audible buzzing noise that lets you know that you have a certain amount of time and space left in your septic tank before things begin to back up. Your immediate response to this should be to lower the capacity of your water use and to address the issue immediately. In most cases, the septic alarms are telling you that you have an issue with capacity. Septic tank problems are generally caused by the tank being full and ready to be pumped out, but the reality may be that there are other problems that need to be addressed. You will want to telephone your plumber or your pumping company rapidly so that you can have the problem set to rights as quickly as possible. Prior to doing that, however, there are several other things that you might want to check to assure that the problem is not in your system. Wastewater that is flowing far more rapidly than it can be pumped out. Frozen pipes or clogged pipes in your field that are not permitting the water to flow freely to the waste field. Home septic alarms are also known at times to issue a false alarm. You may in fact not be having any septic tank problems and get an alarm to your septic system but in every case, it bears checking out to assure that you don't end up with a backed up septic system to your home. Any time that you have issues with your septic pump there is the chance that septic water and in some cases, quite dirty water can back up into your home. A qualified septic system company, one that pumps out septic tank systems is generally on call 24 hours a day, 7 days a week. Unfortunately, your septic tank problems don't take place during regular business house in many instances. 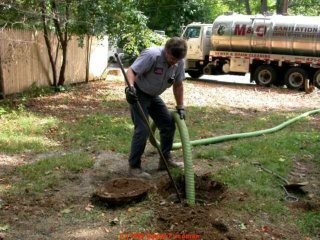 When you hear your alarm for the septic tank that indicates septic problems, your best bet is to phone immediately and then to begin your own look around to be sure that the issue is pinpointed prior to the arrival of your septic tank care company.